Like it. Love it. Wow it! And, we can’t help but agree. As Facebook users, we don’t want to “like” the announcement of a lost dog. And sometimes, we really want to “love” that double bacon cheeseburger you had for dinner yesterday. You’ve probably adopted the practical application of reacting to a post rather seamlessly. Facebook’s hover feature has made it easy to use. However as a business, the introduction of reactions requires a bit more thought. What do reactions mean for your organic reach? How are they counted? How can you utilize them to engage fans? Keep reading. We’re going to break down these questions and more. Currently, Facebook counts all reactions as a “like” – including angry and sad faces. It has been determined that any reaction shows an interest. Folks want to see posts that make them angry as much as they want to see posts that make them happy. Currently, you can’t export reaction analytics. 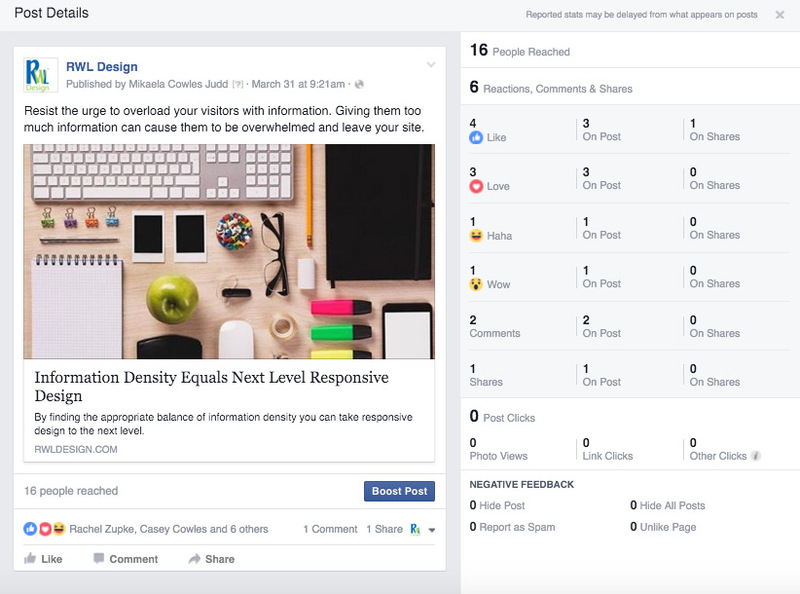 There are only two ways to view reactions: on the post itself and through Facebook Insights. On the post itself, you (and everyone else) can see how many times people reacted and what those reactions were. This won’t show you details about shares. Insider Tip: Viewing reactions on other pages’ posts can be a great way to conduct competitor research. The better bet for viewing your audience’s reaction is through Facebook Insights. As the page admin, you can view insights for a particular post. As in the screenshot below, you’ll be able to see the total number of reactions, the number of reactions on the post, and the number of shares. Because the analytics on reactions are limited, tracking the correlation between adspend and a specific reaction increase is not possible at this time. ? As a page admin, you are able to remove an inflammatory comment. However, you are not able to remove a like or dislike on a post. This same principle applies to all reactions. Reactions can give us better insight into how our audience is feeling. While we wouldn’t suggest you spend hour lamenting over every reaction, reactions present a great opportunity to see how your audience is feeling. Tracking what makes your audience angry and what makes them happy, allows you to craft messages for specific reactions. Red Robin took a fun twist and asked for a “Yummm” button. The Atlanta Braves gave reactions their own twist. The WTKR NewsChannel 3 invites fans to try out reactions. Inside Cheerleading Magazine suggested the love reaction within their photo in the shape of a hand. Chevrolet has gone so far as to incorporate a little love into their cover photo. Need some help creating a love worthy graphic? Give us a shout.